Debris netting, also known as debris containment netting, is commonly used on construction sites for the protection of personnel, property and the public from failing debris. Debris netting can be used on scaffolding during construction or renovation work to keep debris and building materials contained on building sites. This helps to protect pedestrians and traffic from falling items as well as increasing site safety by providing a safer work environment. Debris netting can be combined with fall arrest nets or personnel safety nets to provide protection from smaller items and particles. Our debris netting is made from high quality UV stabilized polyethylene close mesh. The netting is available with fire retardant treatment, which makes it suitable for both indoor and outdoor use. The fabric is air permeable and this prevents small particles such as gravel, sand and other small objects from being blown around in the air. 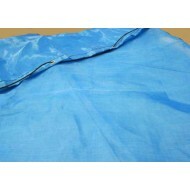 It also provides a degree of protection against rain and wind penetration, which protects the workers behind the netting. 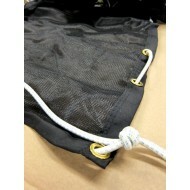 The netting has reinforced edging for additional strength and has eyelets every 0.5m. The nets are available with or without a bungee cord threaded through the periphery, or the netting can be secured with cable ties. 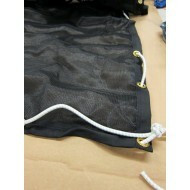 These nets are used extensively by local government, councils and waste movement contractors. 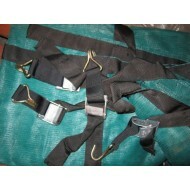 They are also used in the construction, warehousing and transport sectors. Debris netting can even be installed in gardens, enclosures, farms or allotments to help protect plants or crops. Our debris netting is available in a range of sizes and colours, please contact us for further information or to discuss your requirements. 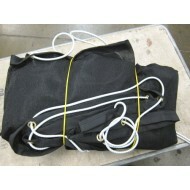 Debris or Mesh netting, also known as debris containment netting, is commonly used on scaffolding on..